Fleetwood first team coach Barry Nicholson relishes learning something every day under the guidance of head coach Uwe Rosler and company. Nicholson has been part of Town’s back room staff since 2014 and has worked under his ex-Preston North End team-mate Graham Alexander, Steven Pressley and now Rosler. The Scot has risen from development squad boss to first team coach during those three years. Rosler ticked off his 100th game as Town boss at Yeovil on Tuesday and Nicholson reached the same landmark in his first team coach role that night, having taken the job weeks before the German’s arrival in the summer of 2016. Nicholson praised Rosler and says he wants to keep learning from both Rosler and assistant head coach Rob Kelly. He said: “Uwe has been great with me. I worked with Rob at Preston, so I kind of knew what he was all about, and for the last 18 months he and Uwe have been different class with me. As he continues to learn from Rosler, Nicholson says he will always be thankful to Alexander for giving him his first coaching role. Nicholson hung up his boots after the 2013-14 season at Scottish side Kilmarnock to return to Town in a coaching capacity, having played at Highbury under Alexander in 2012-13. 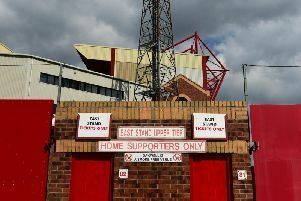 Alexander was sacked from the Highbury hot-seat in 2015 and Nicholson remained to rise through the ranks, moving to his current role when Chris Lucketti left to join Alexander at Scunthorpe. Nicholson says it was good to catch up with Alexander on Saturday despite Town’s 3-2 defeat. Nicholson said: “A disappointing result for us but I had a good chat with Graham after the game. He was obviously disappointed with his players for allowing us to come back from 2-0 down but in the end he got the victory. “I had not seen Graham in a while, so it was good to chat football. “He is the man that brought me to the club and gave me the chance to work with the development squad first, so I have a lot to be thankful to him for.